Fandango Label Night – GumboGumbo! On march 3rd, the kind people of Fandango Music are taking over Het Depot in Leuven (Belgium) to present their artists and releases. Now guess who’ll be playing there. That’s right, it’s us! It will be a great night at a great venue with our fellow Fandango labelmates. 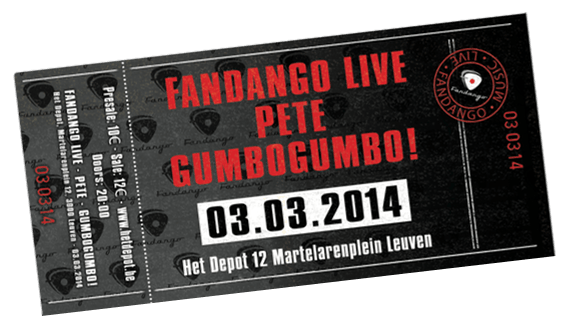 Fandango Live, the studio’s liveband with great musicians will kick off the night, followed by Pete, a great singer songwriter with a unique voice who’s presenting his album “I Am Wilson”, backed up by great musicians as well. At the end of the night the label’s rookies (that’s us) will rock that stage to our best abilities. So come on over, it’s a Monday night, starts at 20h00, what better things could you possibly do on a Monday night? Extend your weekend for another night!